Instead, we got Simple Plan, American Authors, and that guy from Fun. By Kyle Scott Clauss·	 1/4/2016, 9:30 a.m. It is physically impossible to attend a sporting event in Metro Boston without hearing the first two briny notes of the Dropkick Murphys’ 2005 classic “I’m Shipping Up to Boston.” Reworked from an unfinished Woody Guthrie tune and popularized by Martin Scorcese’s 2006 Boston cop flick The Departed, the Celtic punk shanty is the preferred jam of local multibillion-dollar sports franchises, college freshman orientations, and Sam Adams ads. So why were the Dropkick Murphys left out of Boston’s biggest sporting event since the Red Sox won the World Series at Fenway Park in 2013? In case you slept through it—and no one could blame you if you did—the Montreal Canadiens smoked the Bruins in the 2016 Winter Classic at Gillette Stadium on New Year’s Day. Leading up to the game, the band was featured in a short promoting Epix’s four-part series “Road to the NHL Winter Classic,” in which lead singer Ken Casey guaranteed a victory for the B’s. “I love our team. I have full confidence in this game. I’d like to go on record now and guarantee a victory at this year’s Winter Classic,” Casey said. But after the Habs skated circles around a lifeless Bruins team, pausing only for performances by Simple Plan (of Montreal) and Fun. lead singer Nate Ruess’ new solo project, the Milton native felt he needed to clarify. The musical lineup, which also included American Authors, was a bit of a head-scratcher. Then again, this is the same league that booked Nickelback for its awards show in 2012—that is, seven years after “Photograph” came out”—without a shred of irony. 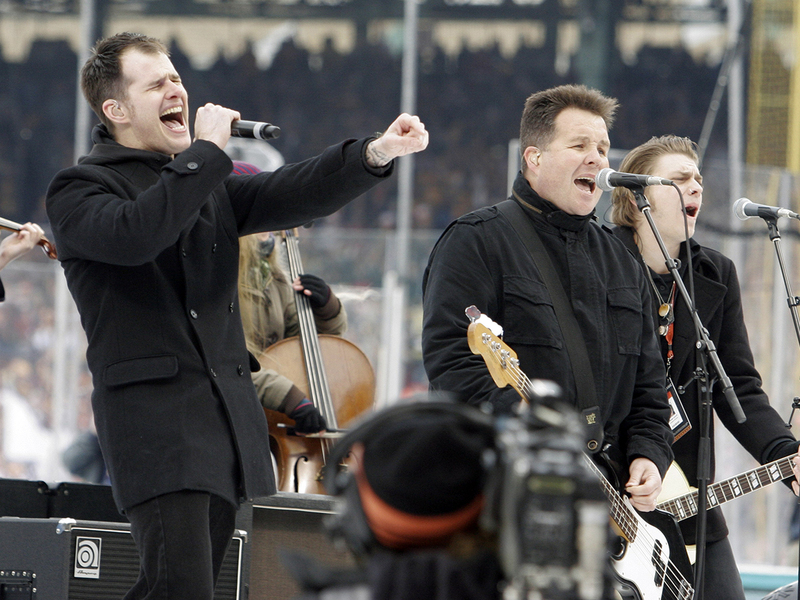 The Dropkick Murphys played the 2010 Winter Classic, in which the Bruins defeated the Philadelphia Flyers 2-1 in overtime at Fenway Park. I’m no statistician, but the Bruins are 1-0-0 in outdoor games in which the Dropkick Murphys perform, and 0-0-1 when they do not.